In the last post, I talked about Tree Following and how I might follow a Holm Oak this year. I think it's a Holm Oak. But I think it's a Holm Oak because someone told me it is. Then someone told me it might not be because it doesn't look quite like other Holm Oaks on the South Coast of England. Well. I don't know! One of the great pleasures I have in blogging is that, starting off as an ignoramus, I learn as I go along. So . . . I went back to the tree and took a few supplementary pictures so I could show it in closer detail. Maybe you can tell me - is this a Holm Oak or is it something else? The leaves aren't the 'traditional' oak shape - the kind the National Trust uses for its emblem. But that isn't the point. 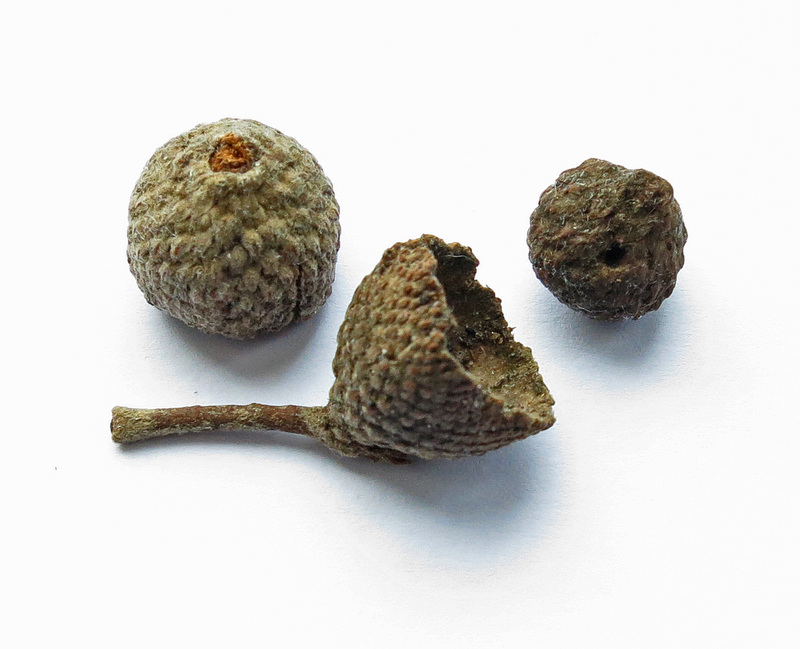 But I also found little somethings - a bit more than a centimeter across - which look like dried out and shrunken mulberries. And I tried one - it fits neatly in one of the cups. Can I be miss-remembering? Does the tree produce these thingies instead of acorns? Here is one of the joys of Tree Following. If I choose this tree this year - come autumn and I'll know. Clambering down the bank, I found the bark on the trunks is interesting and varied. Some are smooth . . . with what looks like ancient art! 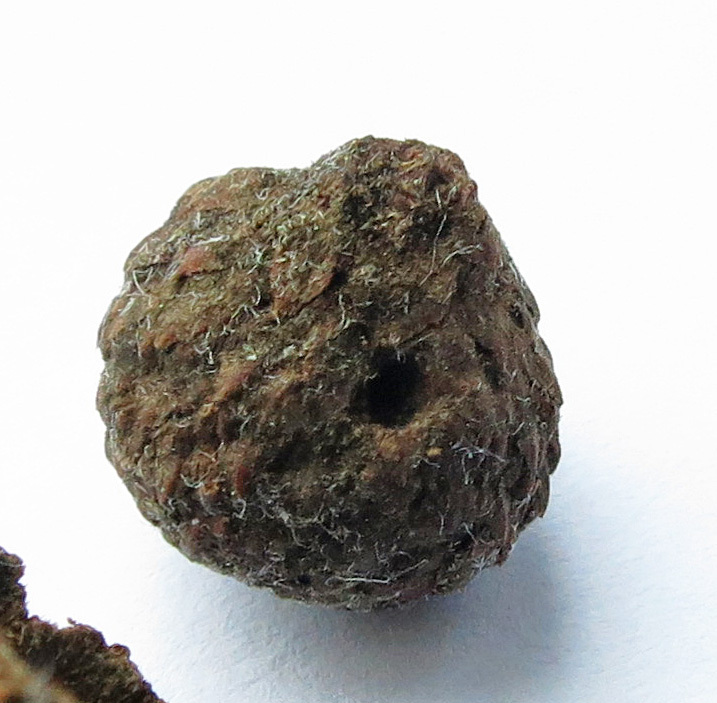 Hollis at In the Company of Plants and Rocks has posted about the Cottonwood tree she'll be following. Well Lucy it's a tree and it has acorns. 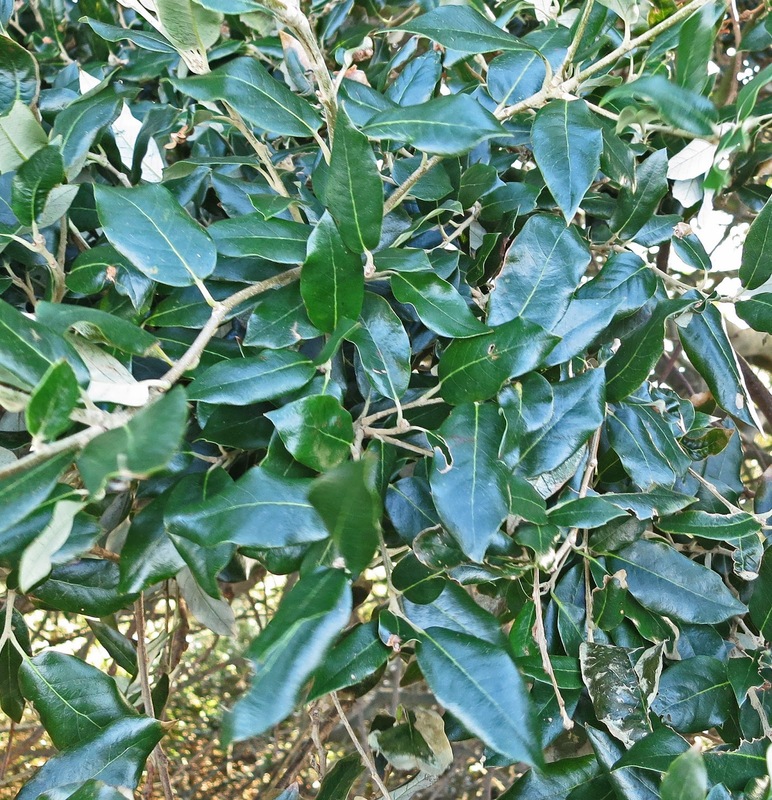 It's evergreen and has leaves like a Holly. My guess is that it is a Holm Oak. The pattern on the bark looks as if it was made by Ivy. Ivy the plant not Ivy who works in the butchers. Hi Adrian. Glad you agree about the ID. Part of the doubt has arisen because it has multiple trunks. I think this may be because people are used to seeing well kept trees which have been grown to have single trunks rather than free-spirited ones which have grown in the wild. It's the multiplicity of trunks which, I think, gives this one its grace. The leaves are so dense its top can be a bit clumpy. We will have to look out for this next time we are walking close to you. The first time we ever heard about Holm oaks was when J visited an old man at Lodmoor Hill who gave him a cutting. 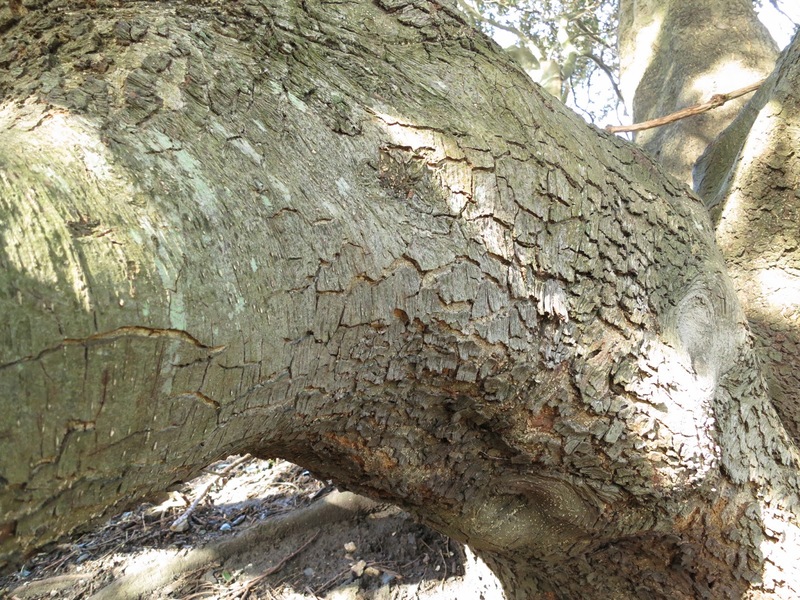 There is a Holm oak in Fulham Palace that has many trunks. It does look like a holm oak. Could your tree have been pollarded way back in its youth? That could lead to multiple trunks. A lot of very old New Forest beeches were pollarded in past centuries and have multiple trunks growing in all sorts of interesting angles. Hi Lucy, I'd always wondered what a Holm oak looked like, as they are woven into so much myth and folklore. Thanks for that. I have joined up to your 'tree' Linky and will be following my Prunus Serrula , so waiting for the starting gun! Great idea and thanks to Janet for the heads up! I think I may do this - I can recommend The Tree in Changing Light for all tree lovers. Most of our native trees do not shed their leaves in autumn - so the changes here are a bit less dramatic than back in the UK. 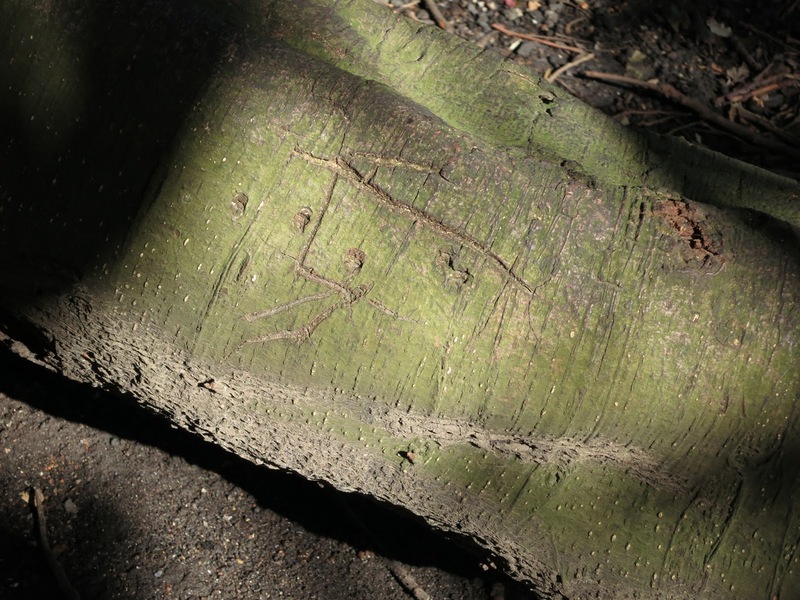 That tree bark really does look like a cave drawing. We've no Holm Oaks in my locality.